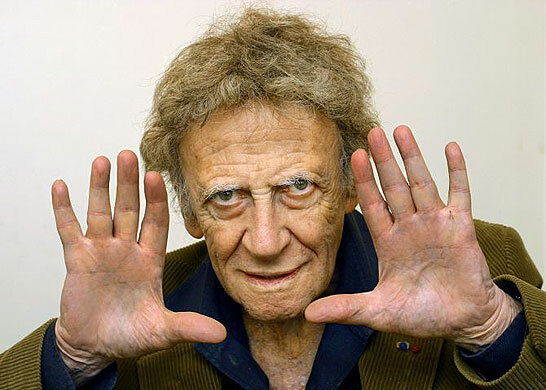 While browsing another topic in this forum regarding hand gestures VIIc - Discussions about HAND GESTURES it occurred to me that perhaps one of the most interesting people who made use of the hands in communicating was the internationally famous actor and mime Marcel Marceau. So, I did a search on the web and found quite a few photographic examples of his hands in action. M. Marceau had what looks to me to be fascinating hands. I would be very interested to hear from others their take on how they would read his hands. thank you for the hand of the most well-known pantomime. - The signature of the lines in the left and right are very different. - In the right, the Jupiter finger is very bent which can be a sign of a self-esteem problem, probably in connection with a father problem (father deficite) or of beeing hurted from that side. - Then is the very high set Apollon and Mercury fingers are very ununusal. I would count this as a special accentuation of his self expression on the field of art. I am reading my first book on palm reading by Cheiro and the thing he says about a long mercury finger is interesting. The focus being on such a person's command of language and eloquence. Very interesting that his abilities were in fact to not use words at all. I have only heard one word come out of his mouth which was "No!" in the movie "Silent Movie" by Mel Brooks. I am interested in how you view his thumb. Am I right in saying that it is standing very far out from the hand at a right angle (or more)? Does this indicate that he did everything to the extreme? the outstanding thumb I would bring together with a need to be independent and to do things by his own.